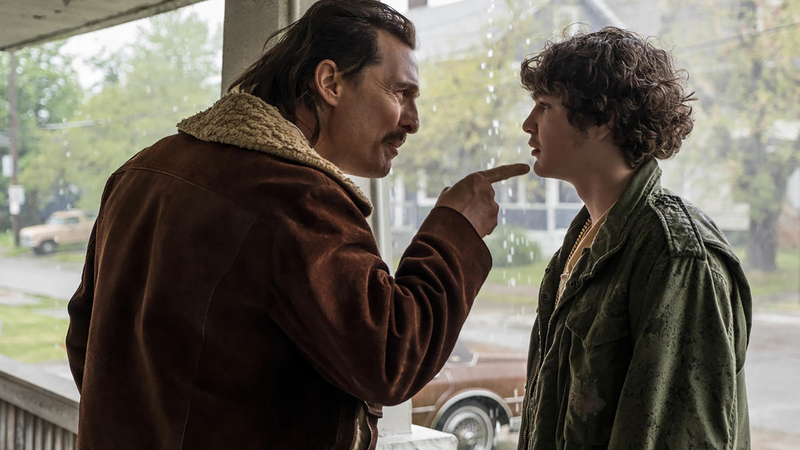 What’s shocking about White Boy Rick is not the lower-middle class family drama of 1980s eastside Detroit; it’s not the violence (relatively mild for a drug film); it’s not the depiction of a young girl becoming addicted to drugs and then forced through withdrawal and recovery by her father and brother; it’s not the apathy of the FBI using a 14-year-old for their own ends with little regard for his life or future. No, what’s shocking is that the movie is kind of funny. It’s hard to say that it’s really funny because all that other stuff’s happening too, and the laughs are too few and far between, but... it's funny. It has funny moments, but there’s little that’s amusing about this tale. White Boy Rick is the story of Richard Wershe Jr. and his activities in 1980s Detroit as a drug dealer and the youngest FBI informant in history. Rick (newcomer Richie Merritt), is introduced as a street-wise, or at least gun-wise, young man, helping his father hustle small time, buying and selling guns. Their introduction scene is pivotal in setting up not only the culture of 1980s Detroit, an apparent near-wasteland of American manufacturing excess in decay where everyone (and their grandmother—literally) is carrying a gun (and on the take if in law or politics), but also in the power dynamic of the hapless Rick and just about everyone he knows. At first glance, Rick seems cleverer than his age, spouting off gun minutia that distinguishes Russian manufactured AK-47s from their inferior Egyptian imitations when dealing with a shady gun dealer. At the heart of it though, he’s relying upon his father (Matthew McConaughey) for guidance at nearly every turn. Granted, many teenagers do, but the point is that this is not Scarface. You don’t get a sense of Rick’s motivations. There’s no overpowering need to accumulate wealth or power. When Rick gets money, and is out partying the night away with the right players, he returns to his dad’s home and collapses into the same teenager’s room he started in. Rather, Rick seems more a helpless shuttlecock being slammed back and forth through the air by anyone who can grab a racket (his father, his sister, his friends, the FBI, the police, and even—no joke—a six-year-old boy). Rick seems to move from scene to scene with the most innocent and content of smiles plastered to his face, not really understanding anything that’s happening, having his ignorance thrown in his face by his better-informed peers (adults) and used against him by law enforcement. You might almost feel bad for the kid if it weren’t for the blatant stupidity attributed to him at many turns. When, halfway through the film, Rick has avoided death and legal entanglement only to go right back to dealing drugs again, you root for him (in the proverbial sense that we all want our neighbors to do well), right up until he drives up to his house in a Mercedes with the vanity plates SNOWMAN and you have to acknowledge that the kid should go to jail. Have the cops who were tailing him 24 hours a day in the first act suddenly pulled up and left Detroit once and for all? Of course not, but Rick’s so busy looking at the bunny shaped cloud, or thinking about how good his Grandma’s hot cocoa is that he never sees them tailing him. There are never issues of character credibility, despite what feels like a phone-in from McConaughey: the actors are great. 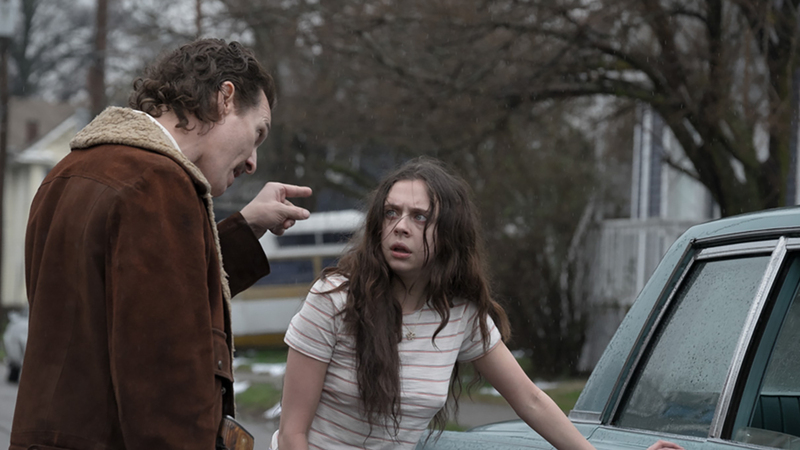 Rick’s sister Dawn (the highly believable Bel Powley who was great in this year’s Wildling) is a drug addict. Rick’s fellow dealers are dealers. And the codeless FBI are G-Men to the e’s in stereotype. But motivations, especially when it comes to the titular Rick, are utterly lacking. Why does he do anything he does? To better his family’s circumstances? Loosely, but even that seems thinner than McConaughey’s hair. He’s no drug kingpin—he’s just a kid following a formula he was given. He even regurgitates advice he’s given ad hoc, not demonstrating wisdom, but rather, a lack of it. This helplessness seems part of a half-assed narrative designed to pull heartstrings at the film’s conclusion when you learn of Rick’s fate. It’s very much a play stolen from Making a Murderer, only one that feels less born from conviction than a standard box office money-grab ploy. It’s not a bad movie, but it’s not a good one either—no one did anything to elevate this film beyond what it is, and at the end, you leave the theater much like Rick made his way from point A to point B throughout the movie. No thoughts, detached, and the semblance of a smile, or maybe a grimace, happily stuck to your face.